Calder Davey has spent the last three years going from living in a small apartment in Sacramento, to a much smaller bed in the back of his truck. His first stop was Yosemite Valley where he was employed by the concessionaire making sandwiches for tourists and the occasional Honnold or Chin. After quickly learning that working in the Valley isn’t very compatible with spending time on the cliffs, he went to the next best place, Bishop, Ca. Here Calder found a home that suited his interests and freedom and felt more of a belonging with a more hush-hush community of climbers and artists. Six months of enjoying the new social climate and splitter weather, he found himself laying in the dirt in the middle of the night at a small crag just outside of town, being rescued by the Inyo SAR Team after falling while free soloing. Calder spent the summer of 2017 laying in a hospital, accepting the decisions he’s made, and wondering if he’ll be able to move and feel his body like he once had. During this time, he enjoyed a new found pleasure in photography that was previously only a high school hobby. Calder’s presentation explores the love of a life spent living out of a truck in one of the most beautiful areas in the country, the risks and penalties for roping up without a rope, and what reflection and art-making can do to the human spirit. Calder is a freelance climbing and portrait photographer, but mostly an all-around goof ball. He still lives out of his truck. Ryan Tetz, long time Eastside resident, is an accomplished endurance athlete, mountain guide, and climber. He makes his home in Mammoth Lakes and works as nurse. Recently Ryan has focused on testing his endurance limits by combining both biking and peak bagging link ups crossing the highest peaks in the California. This last September, he attempted a new record Fastest Known Time (FKT) finishing all the California 14,000 foot summits in a little over 8 days – in a memorably epic adventure all around. “Some of the wilder moments are about as far out there as I’ve been on on my own!” Ryan also holds the current time for fastest human powered ascent from the lowest to highest points in the USA – from Badwater, Death Valley to the Mount Whitney summit among other enduro accomplishments. Armin Fisher will present a three week trip he took to Pakistan in June/July of 2017 with the objective of trekking up the Baltoro glacier to K2 basecamp and then climbing the beautiful Great Trango Tower by the Woolens route. “This was a fantastic adventure in post 9/11 Pakistan basically deserted by fear of terrorism”. Armin is an American UIAGM mountain and ski guide living in Algna Valsesia at the base of the Monte Rosa in the Italian Alps. He was raised in the Napa Valley of California but has lived in Europe most of his life. Armin has multiple first ascents in Europe and has climbing experience worldwide in North and South America, Asia, Africa and Europe. Armin is an ambassador for Marmot and founded the guide service Mountains and More. Canyonlands National Park, one of five national parks in Utah, is by far the largest and considered the most remote. Join explorers Josh Pearlman, Lisa Garmat and Seth Dilles as they float and camp 56 miles on the Green River to the gate of the remote Maze District of Canyonlands where they pull out their packs to continue another 50+ miles on foot through the Maze. Laugh with our presenters as they float for four days down the legendary Green River, exploring Ancestral Puebloan Ruins, sight bighorn sheep and lazily drift through miles of sandstone cliffs. Then to the confluence of the Green and Colorado Rivers and park the boats at Spanish Bottom just above the famed Cataract Canyon. From Spanish Bottom they will take you along as they climb up through the Doll House with heavy packs for a 50+ mile loop through the remote and rugged Maze District of Canyonlands. Their journey will take them up and down from the rim numerous times as they explore native petroglyphs, the mind bending Chocolate Drops in their constant search for water. For a perfect finale, they return back to Spanish Bottom to be picked up and taken back up the mighty Colorado River to Moab by jetboat. Backpacker Magazine rated The Maze District as the most dangerous hiking in America. Park Ranger Paul Henderson is quoted as saying “You’d better be a map savant if you want to wander into–and back out of–this redrock jungle, which is full of dead-end canyons. This is not the place for inexperienced hikers”. Do you dream of bikepacking? Well, it’s time to wake up, gear up and get out. Bikepacking is not for only mutant racer-types and crusty globetrotters with too much time off. Bikepacking is for everyone and it’s not difficult. Learn some basic approaches, strategies and other insider voodoo that are sure to equip the novice bikepacker to, at the very least, get into trouble far from home…or, possibly, have the indelible adventure of a lifetime! 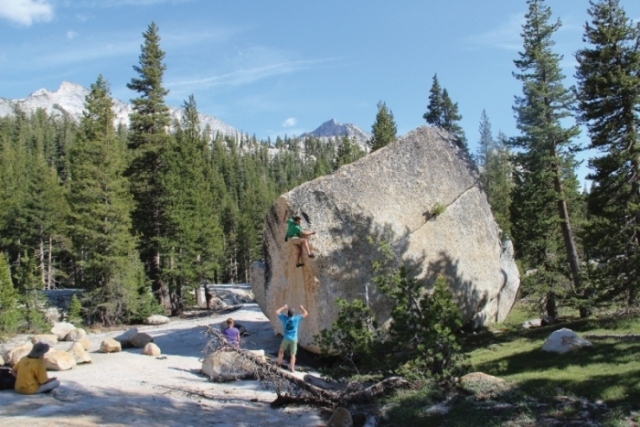 The Rock Ice & Mountain Club has booked several individual camp sites in Tuolumne Meadows for September 6-9, 2018. We encourage our members and non-members to signup for this trip. We are not charging members or non-members to attend. If you would like to attend, please send an email to Bessie at bessielombardo@gmail.com to reserve a spot!